To absolutely no ones surprise, the Central Kentucky Super Region is absolutely loaded with talent again in 2019. For reference, three of the six team state champions and runner ups from the girls 2018 season are a part of this region. 2019 looks again to feature those teams poised for another run at a title. The past week was the opener for many teams and facelift to the current statewide leaderboard. The most exciting part for a track junkie like me, the wealth was spread out. No one team was absolutely dominant across the board. Of the 18 events contested, 11 different teams had the top mark in an event. This is going to be FUN! For the sprinters, it looked like Tates Creek came out with a focus on the 100m at the Tates Creek All Comers. 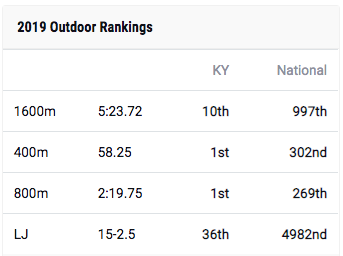 With the top 3 times run this week in the Central Kentucky region, the Commodores again appear to have a complete team that will challenge for individual titles as well as relays led by seniors Rosalynd Hollingsworth and Myann Davidson. 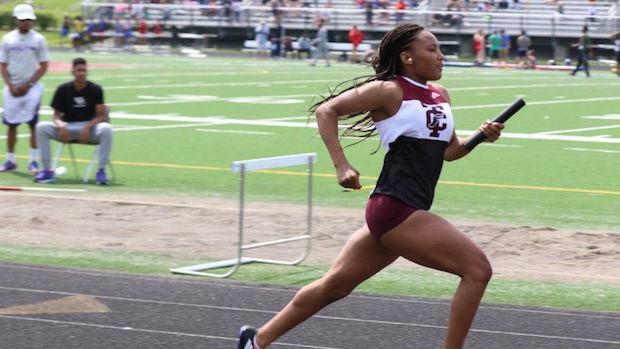 The 200m was a different story with Pulaski County's Maddy Dunn running the fastest 200m in 26.42 but Paris freshman phenom Taesha Speaks put out two of the top 4 times run this week with a 26.48 and 26.95. This week was also a chance for Phoebe McCowan of South Laurel to show everyone that she is not just an 800m runner, but she has that 400m speed too. She was the top performer in the 400m (58.25) at the Williamsburg All Comers as well as the state lead and followed that up in the next event with a state leading 800m time of 2:19.75. We all know she has more time in the tank there with a PR of 2:11.06, but this is a great way to start the season. Check out these current state and national rankings for Phoebe. Zoe Yeast had a fantastic week with the top marks in both the shot put and discus in the region for the junior. Not only did she outperform the remainder fo the region, but she is tops in the shot put and #2 in the discus. This girl is special and her team thinks so too! This week the relays belonged to Bryan Station for the 4x100m and 4x200m and these ladies were hungry. They ran with passion and purpose to put the remainder of the region and state on notice that this is not a foregone conclusion for the state title. The 4x400m best mark went to the Titans of Mercer County with a time that was 10 seconds better than the second best time. These ladies are in late season form with a 4:09.06 this week having run a state leading 4:08.83 already this outdoor season. On the 4x800m, it appears we haven't gotten started completely in the event. Lafayette had the best mark of the week at 10:09.55 and the distance heavy Bourbon County with second best at 10:10.55, but we know both of those squads as well as others, have more to give and we will watch those marks drop all season long. For the horizontal jumps, we head to Somerset to find the weekly winner of the long jump in Kendall Burgess taking the Randy Elmore PCI Track Classic in a leap of 17'8". This was a PR for her and a best jump of the season by over 2 feet. Keyandra Mason of Madison Central had her way with the triple jump as she had the top two marks for the week with nearly identical 36'8" and 36'7.75" jumps to out jump the next best jumper in Jasmine Claunch who went 36'4.5". West Jessamine Colts boast the top high jumper of the week in Anna Hylen who cleared 5'0" at the Tates Creek All Comers off of a rubberized surface. Meanwhile, the pole vault top mark went to the newest Lafayette vaulter in Sarah Ferguson. Lafayette graduated one of the top female vaulters we have seen in a while in Kristina Leggas, and it appears they have reloaded with an all star freshman who is already clearing 11'0". She was not alone at that height this week as Heather Woodie of Scott County and Ashley Smith from Boyle County also cleared 11'0" at the Tates Creek All Comers. The hurdles were not left without drama this week as Woodford County teammates Callie Gormley and Esther Bradshaw went 1-2 in the 100m hurdles at the Tates Creek All Comers and were that way for the entire region. That order was flipped in the 300m hurdles with one caveat, George Rogers Clark junior Makenzie Cooper bested both of their times by running a 48.54 at the GRC Heavy Metal Throw Down. Makenzie Cooper took the GRC Heavy Metal Throw Down 300m hurdles runner up and top Central KY Super Region time. Last, but certainly not least were the distance events. Y'all, we have two of the best in the state in this Central Kentucky Super Region. Eighth grader Ciara O'Shea went out and put down a 5:16.90 1600m time to place third at the GRC Heavy Metal Throw Down. We look for her to improve that time as the season progresses and be a top contender come state meet time. Then we have Tates Creek senior Jenna Strange. Her 11:14.46 is the #1 time in the state and she will only get better. With a lifetime PR of 11:04.41 and a state championship on the mind, the Eastern Carolina signee looks to close out a career at Tates Creek in winning fashion. Wow Wow Wow: Central KY Boys are FAST! I am going to my very best to not be blown away by early season marks and the implications that this past week could have on the last weekend in May, but WOW! From the sprinters to the distance runners to the hurdlers and back to the jumpers and throwers, this Super Region is stacked. Do you want drama? Check out the Tates Creek Commodore Classic on April 13 and who is slated to compete and you will see why the KYtrackXC team will be streaming LIVE this year. The talent is outstanding and will be made even more so when those athletes from outside of this region come to compete. So let's breakdown the last week. For a change of pace, let's start with our throwers as Nathan Ray of Green County had himself a week. Nathan had the top throw in both events at the Greenwood All Comers. Currently ranked 3rd in discus and 12th in shot put throughout the entire state, the senior is ready to set new PRs in his final season in Greensburg. The jumpers this week were led by Marquise Kinley of Boyle County with a 22'9" long jump and Chase Pressley in the triple jump with a 43'8" jump. The Central Kentucky name we are waiting to top the leaderboards in Christian Lewis of Frederick Douglass was second at the Tates Creek All Comers in the long jump with a 21'1" jump. Work left to be done there to reclaim his title of top jumper after a stellar indoor season. Yeah, WOW! These guys will all rematch on April 13 at the Commodore Classic at Tates Creek and will add in some other top talent from Louisville. I am just going to leave this right here to marinate while you also take a look at the top marks from the week in the 200m. Yeah, so....it is fast in this region of the state! The speed is not isolated to the sprint events. The middle distance and distance events had their fair share of top end marks. Led by Austin Mathews' 4:15.44 1600m time that placed him as the #1 time in the state, the distance boys went off. Connor O'Shea ran a 9:54.47 3200m to have the #6 time in the state while fellow Central Kentucky runner Connor Hayes holds the top spot at 9:40.42. Then Hayes' teammate Andrew Madden runs a 2:01.88 in the 800m at the Tates Creek All Comers to lead the region this week in that event. Likely the gentlemen that was the busiest this week was William Wharton. The Lafayette junior had the top mark in the region in the 400m at the GRC Heavy Metal Throw Down with a 50.97 but also was in the top 5 in both the 100m and 200m. He has some work to do in the 400m to catch current state leader Josiah Taylor of Marion C. Moore, but he has shown that he can compete when he was state runner up last outdoor season with a PR of 48.72. Mario Paul of Paul Dunbar had himself a week as he ran the fastest time in the region in both the 110m hurdles and the 300m hurdles at the Tates Creek All Comers. He followed it up with a second place finish at the GRC Heavy Metal Throw Down in the 110m hurdles to East Jessamine's Zion Morgan and a 3rd place finish in the 300m hurdles losing to Morgan and Beck O'Daniel of St. Xavier. Bottom line is, Paul has the makings as a sophomore to be a contender at the state level in the hurdle events and has some hurdles (see what I did there) to overcome this season to fast track that reality. Paul dominated the 300m hurdles at the Tates Creek All Comers. Early in the season it is tough to put too much stock in relays, but Frederick Douglass owned the short relays by taking the top mark in the 4x100m and 4x200m relays this week. The best 4x400m mark went to Lafayette with a 3:38.88 at the GRC Heavy Metal Throw Down while South Laurel had the best 4x800m time in 9:02.64. Still early in the season on the relays. Justin Lehmkuhler continued his tear on the high jump in this region with the top two marks for the week. He cleared 6'4" at the GRC Heavy Metal Throw Down after clearing 6'0" at the Tates Creek All Comers just 3 days prior. Currently the state leader at 6'4" with his PR, he has more to go as his indoor PR is 6'5" done this indoor season at the UK High School Invitational. Could we have another big jumper from Woodford County to follow in the footsteps of Keenon Laine. Lastly, there is something in the water in Madison County with pole vaulters. I suspect it is something that the great Monte Orchard has done. The top vaulters all hail from Madison Central and they are not done yet. Led by EIGHTH GRADER Wyatt Stewart and junior Tristan Petrey, the Indians have a crew. To put a bow on the boys this week in the Central Kentucky Super Region, buckle up. This is going to be fun and there is no end in sight on how fast, far, or high that these gentlemen can go as they continue to compete against each other and improve all culminating in a performance on the blue track at the University of Kentucky.